NIGHT OF THE LIVING DEAD, 1968. 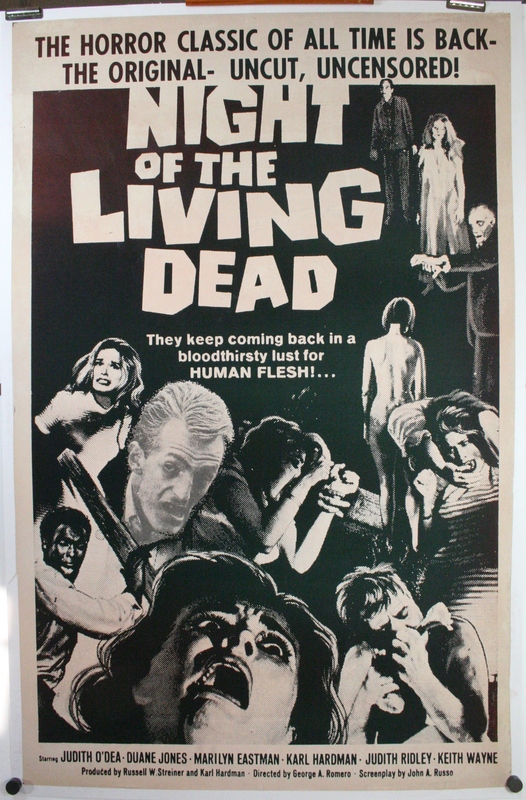 Original RR1969 B/W US Linen backed 1 Sheet (27 x 41 “) vintage Classic Horror Zombie Movie Poster starring; Duane Jones, Judith O’Dea, Karl Hardman, director/writer George A. Romero with screenplay by John A. Russo. This film and poster needs little introduction; George Romero was single handedly responsible for changing the horror genre introducing for arguably the first time, the first seriously scary movie! As a low budget cult film its success was followed by two brilliant sequels, Dawn of the Dead and Day of the Dead; both featured on our site. Follow the links to see. The overall pink hue on this Black and White film poster is characteristic of originals. One way of spotting a fake is if there is no pink hue, but a purely black and white. This is a guaranteed and authenticated original cinema poster. This poster prior to linen backing was in fine to very fine condition. It had minor edge fraying, the upper right corner had been folded over sometime during its life and the bottom right corner had been folded over as well. The bottom right had a 0.25 inch tear associated with the fold over. Please understand that the overall pink hue it was originally in C8 Condition. After linen backing the poster remains beautifully preserved and and ready for storage as a wise investment, or for framing to be displayed in all its glory. Buy this piece with love and confidence!